It’s official: Ford and Volkswagen are teaming up like an unlikely pair of automotive Wonder Twins. Their biggest aim? Delivering mid-size pickup trucks and commercial vans to global customers. The biggest downer? Those pickups aren’t coming to North America. Global demand for pickups is expected to grow in the next five years, Ford’s press release notes. It makes sense to team up with another automaker and pool resources to meet the rising demand. However, Ford’s Jim Farley has stated that those pickups aren’t coming to North America—only to South America, Africa, and Europe. It’s disappointing, yes, but not entirely unexpected—after all, the designs that Ford is basing their new products off of aren’t actually sold in North America. Ford’s pickups are going to be based off of Ford’s global Ranger, and its new vans are going to be based on their Transit Custom—two products you can’t exactly find stateside. I mean, you can, we just get them with extensive modification for American standards and buyer tastes. Over time, this alliance will help both companies create value and meet the needs of our customers and society. It will not only drive significant efficiencies and help both companies improve their fitness, but also gives us the opportunity to collaborate on shaping the next era of mobility. VW’s new EV work is promising, so a pair up could be interesting. Electric and autonomous vehicles are an exciting market globally (and yes, that includes the US). 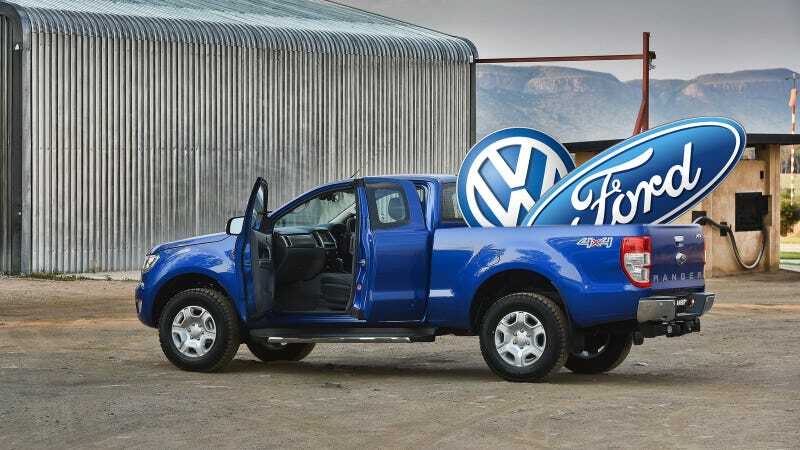 If Ford and Volkswagen expand their partnership into new fields, we may be able to expect some vehicles in the states. Until then, we just get to stare longingly at the neat new pickups as they grow closer to their international release.